The center plate have standart mounting holes. There is enough space for locating Electronic speed controllers and other equipment. 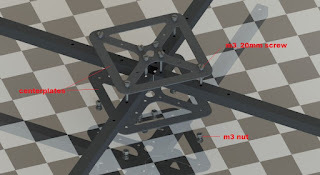 Leight weighted,rigid and easy to build quadrocopter frame. Motors and motor cables must assembled to arms before frame assembly.